Seek To Know The Truth: What Is Biblical Repentance? Repentance is no more a meritorious work than its counterpart, faith. 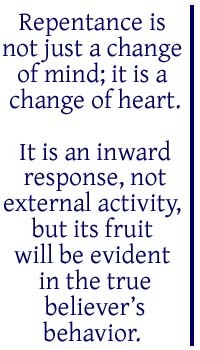 It is an inward response. Genuine repentance pleads with the Lord to forgive and deliver from the burden of sin and the fear of judgment and hell. It is the attitude of the publican who, fearful of even looking toward heaven, smote his breast and cried, "God, be merciful to me, the sinner!" (Luke 18:13). Repentance is not merely behavior reform. But because true repentance involves a change of heart and purpose, it inevitablyresults in a change of behavior. Like faith, repentance has intellectual, emotional, and volitional ramifications. Berkhof describes the intellectual element of repentance as "a change of view, a recognition of sin as involving personal guilt, defilement, and helplessness." The emotional element is "a change of feeling, manifesting itself in sorrow for sin committed against a holy God." The volitional element is "a change of purpose, an inward turning away from sin, and a disposition to seek pardon and cleansing." (Berkhof,Systematic Theology, 486) Each of those three elements is deficient apart from the others. Repentance is a response of the total person; therefore some speak of it as total surrender. But the predominate no-lordship view on repentance is simply to redefine repentance as a change of mind--not a turning from sin or a change of purpose. This view states, "In both the Old and New Testaments repentancemeans 'to change one's mind' " (Ryire, So Great Salvation, 92). "Is repentance a condition for receiving eternal life? Yes, if it is repentance or changing one's mind about Jesus Christ. 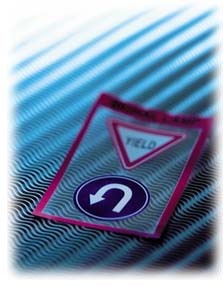 No if it means to be sorry for sin or even resolve to turn from sin" (SGS 99). Repentance by that definition is simply a synonym for the no-lordship definition of faith. It is simply an intellectual exercise.